When installing a shower area or constructing a wet room, it is vital that the walls are fully waterproofed. 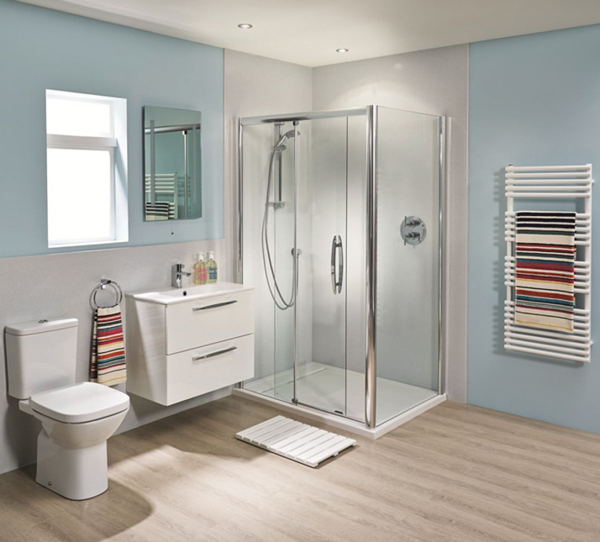 Over the years, tiles have been the most effective way and whilst they are still widely used, recently shower panels have been developed and these modern shower panels offer a smooth clean and attractive surface. Shower wall panels offer a great alternative to tile, they are easy to keep clean, will stay fresh looking for years and never need re-grouting. Panels can be fitted to almost any surface, including concrete, chipboard even over old tiling, labour costs are reduced because they are easy and fast to install. Shower panels are available in a range of no less than eleven distinctive colours including Arctic, Stone, Ice, Silver Travertine, Soapstone Sequoia, Travertine, Dolce Macchiato, Dolce Vita, Ivory Marble, Vanilla Quartz and White Quartz. These beautiful and distinctive finishes are virtually indistinguishable from real quartz, travertine or mineral. When correctly installed, the shower panel will be leak free, a sleek and smooth surface and very easy to keep clean and free from dirt. The panels are in kit form and this kit comes with two 1200mm post formed panels, and one 1200mm panel fitted with a tongue and groove cut, adhesive is supplied with the kit. For more information about the colours available plus our unbeatable price, check the product page for the colour range and full specification.